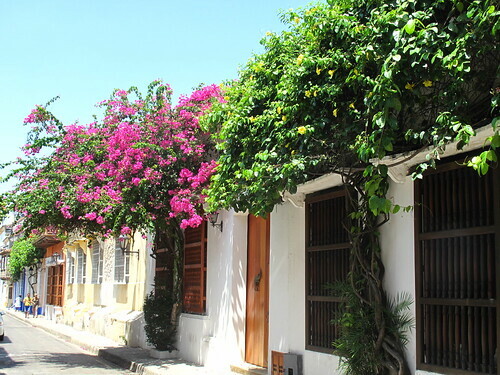 Even though I’d just read Gabriel Garcia Marquez’s ‘Love in the Time of Cholera’, with its vivid description of the heat of Cartagena in the summer months, nothing could prepare me for quite how intense the humidity would be when I got there. Even just wandering around slowly, taking in all the beautiful colonial buildings, left me almost as sweaty as I’d been hiking uphill through the jungle on the Lost City trek. Which is a shame, as I could easily have spent all day every day just strolling around the streets of the old town – there are very few modern buildings, and it’s easy to get lost just taking in all the picturesque little lanes filled with colourful houses with pretty little wooden balconies. 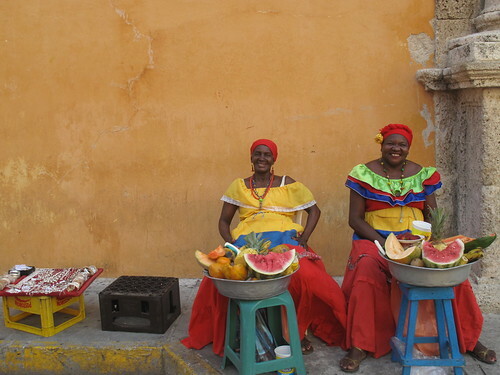 Cartagena initially grow wealthy as one of the main ports for exporting gold and other precious metals from the colonies in South America back to Spain. Attracted by this wealth, the city was regularly attacked by pirates. Most succesful of these was Sir Francis Drake, who destroyed a huge section of the city, and who was only succesfully disuaded from doing so again by the payment of ransom that would be worth $200m in today’s money. I’d grown up knowing of his exploits in saving England from the Spanish Armada, so it was interesting to visit a place where he’s better known as a ruthless pirate. After these attacks, the Spanish were determined never to let it happen again, so the city’s defences were boosted with huge walls and an imposing fortress overlooking the city. Even the Cathedral, destroyed in Drake’s raid, was rebuilt in unusually sturdy fashion. So I suppose you could say that the Colombians have a Brit to thank for the city’s current beauty! If anything, the city is even more beautiful by night (sorry folks, you’ll just have to trust me on that one, as I forgot to take my camera out in the evening), as the walls and all the churches are lit up, highlighting all the beautiful colours, although unfortunately it’s still nearly as hot and humid. One evening I finally got the chance to meet up with my first ever fellow travel blogger – Liz and her husband Adrian, who are on quite a similar trip to me, and whose blog, Where are Liz and Adrian? I’ve been following since the start. We’ve been to several of the same places already, although never at the same time, so it was great to finally meet, have a chat with Liz about the difficulties of trying to keep a blog up to date when there are a million more fun things to do all the time, and with Adrian about the various things he misses from the UK after living in Canada for so long. They’re now elsewhere in Colombia, but hopefully we’ll get to catch up again somewhere else along the way. Luckily the city offered a couple of ways to escape the heat – my hostel (the beautiful Media Luna) had a pool which was the perfect way to spend the afternoons after a hot morning traipsing around. Even better was a trip to the nearby mud volcano. I had no idea what to expect, and to be honest I was only going because I’d been told it was one of the area’s ‘must dos’ rather than out of any urgent desire to see it. There was no way I expected to enjoy it anywhere near as much as I did – it’s a truly bizarre and quite unique experience. Just along the coast from Cartagena is a region where mud bubbles up from the ground, and in one spot it has formed a little mud volcano (which has actually been shored up by the locals to make it look a bit more impressive). It’s only about 15m high, and you climb up the side on a little wooden staircase before clambering down into the lukewarm mud. It’s one of the strangest sensations I’ve ever felt. It’s a bit like being dunked in a giant pot of tepid chocolate mousse, and it’s so dense that it’s absolutely impossible to sink – despite not being able to touch the bottom, with no effort at all you can just stand there. In fact you’re so bouyant it’s quite easy to find your legs floating up behind you to the surface, threatening to leave you face down in the mud, so you have to get other people to push you back down. It’s hard to describe why it’s quite as fun as it is, but we spent an hour in there and spent most of it in absolute hysterics, particularly later on as we were almost packed in like sardines. In fact I had so much fun I enjoyed it more than Cartagena. 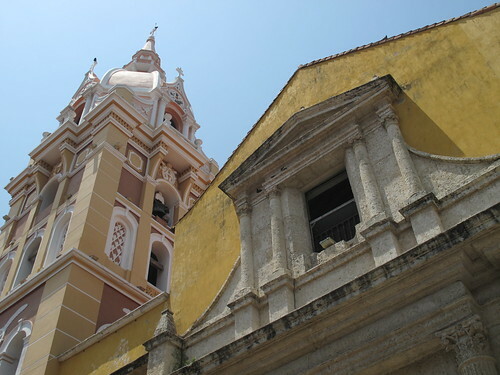 Which is a lesson I’m increasingly learning on my trip – there are plenty of places that are absolutely beautiful and worthy of their fame as tourist destinations, but more and more it’s the little unusual and quirky places like the Mummy Museum in Guanajuato and the mud volcano in Cartagena that are standing out as my favourites. You can see all of my photos from Cartagena and the Mud Volcano here. 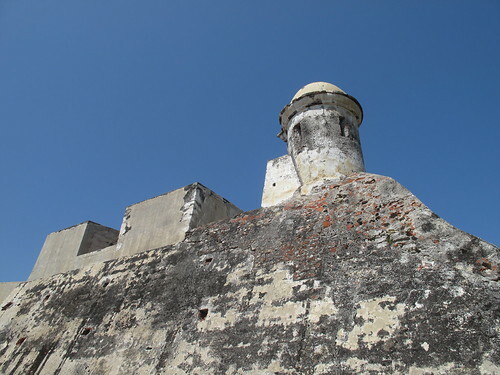 This entry was posted in Colombia, World Heritage Sites and tagged blogsherpa, Caribbean Coast, Cartagena, Cartagena de Indias, Colombia, Mud, Mud Volcano, rtw, South America, travel, UNESCO, UNESCO World Heritage, World Heritage. Bookmark the permalink. 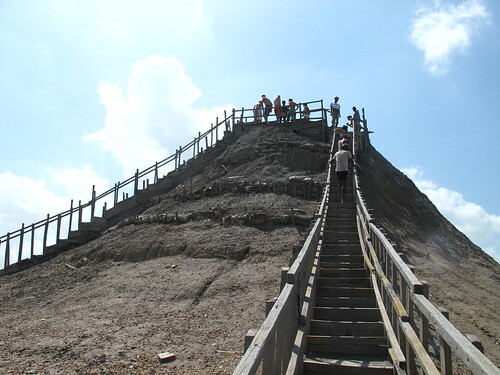 Both the city and the mud volcano look amazing from your post. Take care!